We could have been killed. Worse than that we could have been caught. By those men? Those aren’t men they are the living dead! So zombie films have been extremely popular the last few years, they have encountered many changes; but they all owe it to this movie. Yes this is the first full length feature film about Zombies. Instead of biting or disease; this man makes Zombies through Voodoo, poison, drugs, and his eyes! I first became aware of this film when I watched 50 Greatest Horror Classics Collection. I know that I have been reviewing films I didn’t like these past few days, so here we go with one I do. This film has a very interesting background. The film was thought lost until found in the 1960s, there it went a serious court battle as multiple people fought for ownership. It only took eleven days to film but it was such a hit when it premiered. It did so well, that Lugosi regretted taking a salary instead of a percentage. Well I think that is enough talking about it, shall we move on to the review? So the film starts off with a young couple, Neil Parker and his fiancé Madeline Short. They have just arrived in the West Indies. Neil has a job out there and went for Madeline. They planned to marry as soon as they touched the port, but they meet Charles Beaumont who presented them with a better job offer, and they are headed to his house and to be married tonight. If only they knew what was coming. As they are driving in the buggy, they come upon a funeral in the middle of the road. It sounds strange, but they do that so people don’t dig them up and use them with voodoo, or turn them into zombies, the living dead. Then “Murder” Legendre, Bela Lugosi, come upon them with his group of Zombies. He steals Madeline’s scarf, and stares at her with his creepy eyes. The driver, fearful, takes off at the speed of light. “Neil Parker: We could have been killed. Driver: Worse than that we could have been caught! Madeline Short: By those men? Driver: Those aren’t men they are the living dead. Zombies! They are startled when they come upon the minister, having arrived at the Beaumont mansion for their wedding. They ask about zombies, and the minister, Dr. Bruner, says he has been a missionary there for over thirty years and he has seen a lot of strange things occur. They tell Dr. Bruner about what happened, meeting Beaumont on the boat, the job, etc. The Dr. thinks this is very odd. This Beaumont they describe is nothing like the selfish, pushy, take over man that he knows. Everything about their situation smells bad, and he warns the couple to leave as soon as possible. That makes TWO warnings! They need to leave! When the couple arrives, Mr. Beaumont doesn’t want to see them. But then he changes his mind. Okay this behavior means that there is something else going on here with Beaumont. The butler agrees it is for the best to approach them as the minister is questioning why Beaumont is being so kind. He greets them but then has to leave while everyone prepares for the upcoming wedding. Madeline is getting ready when she looks out the window and sees Beaumont get into a buggy with a man. When we zoom there, the man is emotionless, glazed over, dead eyes, a zombie! Mr. Beaumont reaches a work area and sees 20 or 30 of these same walking dead. All empty eyed, slaves, and ZOMBIES! Legendre greets Mr. Beaumont and puts out his hand, but is ignored as Beaumont sees him as “beneath” him. Legendre then explains about his little operation: about how the dead don’t care about long hours, breaks, food, money, etc. He tries to sell the idea to Beaumont, but business is not on his mind. Instead his mind is on Madeleine. He desperate to have her and is trying to get Legendre to stop the wedding. He thinks that if he took her away for a while she would change her mind. But Legendre does not think that will work, women will not forget so soon. Beaumont pleads with him to do something, anything! Legendre says that he has one way to do it..all Beaumont has to do is give her a tiny bit of this potion in her drink or on a flower and it will enable him to have what he desires. Beaumont doesn’t want to do it that way but Legendre tells him that is impossible, there is no other choice. That might Madeline is getting ready for her wedding, the church is all decorated. Mr. Beaumont walks her down the aisle pleading with her to marry him instead of her fiancé. Madeline kindly refuses. He promises to stop, after one last thing, giving her a rose. Madeline accepts, but little does she know that rose has been tainted with poison and will bring only death! Madeline takes the hand of her love and the ceremony to twine them begins, but out in the courtyard Legendre lurks getting ready his magic. He takes the scarf he stole from her earlier, and wraps it around a wax candle. He looks like the devil with his beard and eyebrows. They all toast and are happy. Immediately she falls down, and we see Lugosi’s eyes, knowing he is controlling her body and spirit. A funeral is held and Madeline is to be buried. Neil goes to a bar to drink, upset, heartbroken and seeing her everywhere. All are happy while he is the one in utter misfortune. Her apparition appears to him, but he can’t reach her. That night Beaumont and Legendre are in the graveyard and they see zombies! Legendre isn’t surprised as they are his slaves. Many have fought against his spells, but Legendre overpowered them all and controls them. The zombies remove Madeline’s casket from the tomb. Just then they hear her husband, drunk, trying to approach the tomb screaming out her name. The zombies quickly take her away to conduct the ceremony elsewhere. Neil finds the grave empty and is distraught. Dr. Bruner explains that there are two ways this could happen. Her bones were taken away to be used in a ceremony by some natives on the island. Or she is not dead. Neil is in shock! Not dead? But he saw her! The doctor said! The minster agrees but he has seen so many strange things on the island, it could be possible! Neil thinks the idea of her being murdered so someone can steal her body is ridiculous. But then Dr. Bruner tries to explain that she isn’t really dead, but instead a type of parlor trick with drugs to make her appear dead. Come on, LISTEN TO THIS MAN! If you had in the beginning you never would have gotten in this mess. So Dr. Bruner explains about a type of drug that produces a deathlike sleep, only to have them “awaken later” and be a zombie, one of the “living dead. I knew about this as I had seen it before in The Four Feathers, and read about how historically some witch doctors would do this. Because of that, I figured out a majority of Sherlock Holmes (2009). They figure out that Beaumont must be the one behind this. Neil wants to take him to the authorities, but the minister reminds him they have no proof. Besides she died. No one would believe Beaumont pretended to kill her. Beaumont has what he wanted and has desired or does he? He has the beautiful body of Madeline but something is missing from her. Her spirit. She is an empty tomb, a shell of who she was, and it is driving Beaumont crazy!!! He gives her the finest things money can buy, all that she could desire, but nothing changes in her eyes or look. 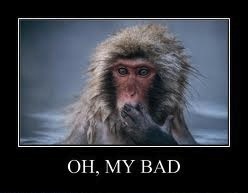 Beaumont realizes his mistake and that he made a bad decision. He thought that just having her would be enough, but in reality he has nothing. Beaumont begs Legendre to bring Madeline back. Legendre warns that Madeline won’t be happy as he just tried to control her. In fact she will most likely be furious. But Beaumont doesn’t care, he needs her. Legendre promises to bring her back and then the two have a toast. Don’t drink, it is a trap!!!! 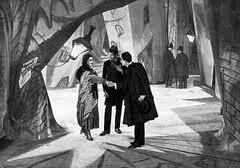 After the drink, Lugosi reveals that he has done the same to Beaumont which he did to Madeline. He does not want to bring her back, as he has other plans for her,ones that Beaumont might not agree to. Beaumont tries to get his butler to help him, but it is too late, he is under Legendre’s control as well. The zombies come and carry the butler away, tossing him off the cliff, and all that is left is Beaumont and Legendre. Dr. Bruner takes Neil to see the witch doctor. Weird, right? He’s a minister. Doesn’t that go against what he represents? Anyways, there they pick up a guide to take them up the mountain and to where Beaumont is housing Madeline. But Neil won’t listen. Neil is trying to climb up the mountain but isn’t doing too well, he’s sick from a tropical disease or hangover. Anyways, as they continue, you hear the vulture, the pet of Legendre; looming overhead, always watching. It reminds me of Maleficent’s bird in Sleeping Beauty. Neil and Dr, Bruner argue over whether he should climb the mountain, Dr. Bruner thinking he is too sick too. Then they see Madeline looking over the balcony. Neli calls out to Madeline hoping to reach her, but she still remains in her zombie state. Beaumont has completely had a breakdown. No longer the powerful one, he too appears in a trance, the guilt of everything weighing down on him. Legendre gave him a special type of poison, he is awake but in a trance and can’t talk, can’t move, a slave and awake inside knowing what he is going through and feeling it. The shots and angles of this are beautiful. From framing Lugosi in the cross architecture, the stairs, etc. There is some beautiful, early, cinematography at play here. So Lugosi sees Neil creeping up the stairs, but he is not really looking like a threat, as he is practically unconscious. Lugosi takes his hands and tries to work his spells on him, with his eyes, the third eye. Madeliene wakes up from her bed and in a trance begins ro walk down thestairs. Searching, searching for what? Madeline being framed in a cross architecture while wearing cross on her dress is almost a virginal sacrifice. Beaumont sees Madeline and wants to help but has no control over his body. She takes a knife from the table. She is just about to stab Neil when she is stopped by a person grabbing her arm and removing the knife. A person dressed in black, who is it? Legendre continues to try and control her but it does not work. She runs and Neil chases after her. She runs to the hillside and looks over the water about to jump but stopped by Neil. He is happy to have her but Madeline remains motionless. Legendre comes followed by his zombie army. Neil has a gun and shoots at the zombies but it doesn’t stop them or produce blood, as they are already dead. The minster was the man in black! 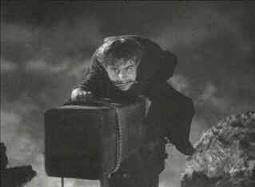 He smacks Lugosi in the head stopping him. All his zombies throw themselves over the cliff, as control is momentarily lost and they wish to remain dead! Madeline wakes up, the control has ended. But no Legendre awakens, he is not one to be easily thwarted and begins to exact his control. Neil and the minster chase after him, but are stopped when he throws some magic dust, burning their eyes. Beaumont creeps dow the steps, and we only see his shadow. He knocks Legendre over the cliff, his vulture/spirit guide thing going too. Madeline is awaken and reunited with her love. And the bride and groom get to go off and have their honeymoon. A great film. You should definitely check it out. They’re coming for you, Barbara! This is an amazing film! George A. Romero is truly an amazing screenplay writer and director. I actually saw the sequel first, Return of the Living Dead, which I also loved. It wasn’t as creepy as this one, but still was very good. The rest of the sequels were stupid though, so don’t waste you time with them. 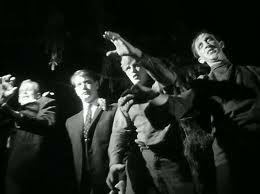 One of the things that makes this film so revolutionary and a cult classic is that it is one of the first films about zombies to depict them as actual living dead and not mind control, like in White Zombie or Revolt of the Zombies. It also has the zombies being created by radiation instead of controlled by the third eye. I also love how the zombies are true zombies and not any of these super soldiers they make them to be now. The zombies are living dead, so they move slow as their flesh is rotting. They also are destroyed by by fire or a shot to the head. It’s a great zombie film! So the film starts out with Barbara and her brother Johnny going to a cemetery to put flowers on their father’s grave. While they are there, Johnny starts teasing his sister; trying to freak her out. He sees a man approaching and pretends that it is a “ghoul” after her. It turns out the man is a zombie and he starts to attack her. Johnny tries to help her, but hits his head on a gravestone. 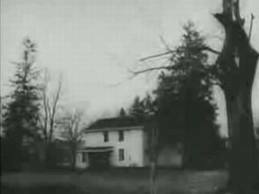 Barbara runs away, and holes up in a farmhouse. Now Barbara is freaked out, but she was pretty awesome in searching out for a knife to protect herself. She ends up being joined by Ben, who stopped at the house when his car runs out of gas. Ben is pretty awesome as he is a super survivalist. By this time Barbara is pretty much incoherent as she has gone into complete shock. They are later joined by others trying to escape these attacks. The film switches from being just a horror film, to being one of survival. We see what everyone’s true characters are as they show how they act in intense situations. The movie is fantastic and has a completely unexpected ending. You’d all love it! Watch this after you’ve seen the film. That’s it for this fearsome Friday! More posts to come! 5 days ’till Halloween! So this is the sequel to Frankenstein and I think a much better film. I know I say I don’t like sequels as much as the original, but there are always a few that I think are better. 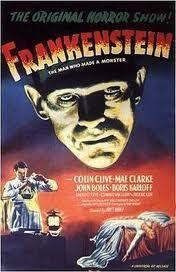 So this movie almost wasn’t created as director James Whale originally did not want to do a sequel to Frankenstein. Universal considered producing a sequel without Whale’s involvement, but after 4 years of constant badgering, Whale agreed to do the film. And I’m so happy he did, or else we would be without this wonderful masterpiece. To be honest, this isn’t a true “sequel.” It actually is the second half of the the book Frankenstein, instead of an individual and separate story. The reason I like this better than the first one is that Frankenstein is creepier, as he is demanding and using his strength and stature to frighten others. You also have a creepier Henry, as he is fighting with himself on whether or not to create more monsters. We see that he doesn’t wish to populate the world with these creatures-but at the same time he is lured by the thrill of creating more, and showing off his genius. Henry Frankenstein: Crazy, am I? We’ll see whether I’m crazy or not. So the film starts off a little different from the other one. 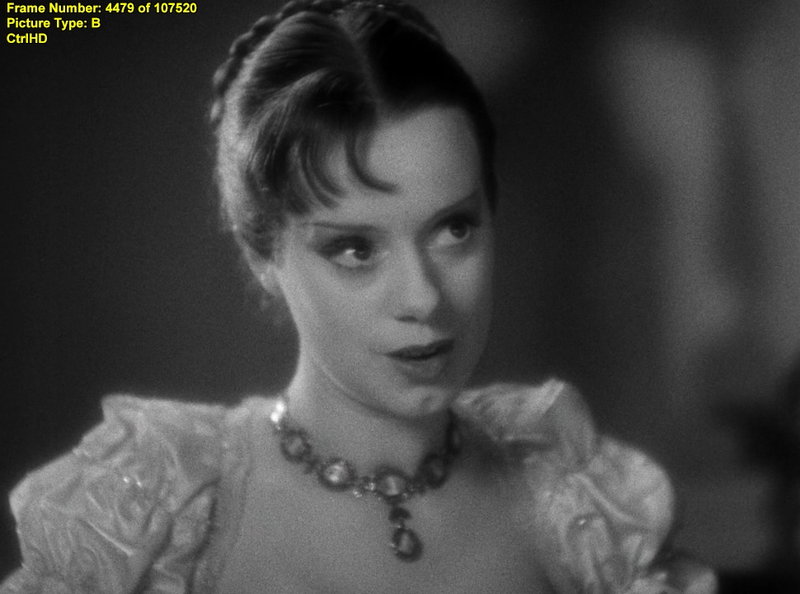 Here we have Elsa Lanchester portraying Mary Shelley and telling the next chapter of the story at a party. The next chapter picks up exactly where the other film ended. The villagers had driven the monster to the windmill and believed they killed him. They take Henry back home where he is nursed to health by his fiancé Elizabeth. However, we see that the creature has not been killed. He escaped the fire by getting into the water under the mill. He kills some people as he escapes into the wilderness. Meanwhile, Henry’s old mentor, Doctor Septimus Pretorius, comes to visit him. He brings along his creations to show Henry. Dr. Pretorius had created miniature people: a miniature queen, king, archbishop, devil, ballerina and mermaid. While Henry had vowed to never create another monster again, seeing these creatures spikes his interest. Meanwhile, the monster has run off into the woods and has tried to find a place to belong. He attempts to befriend a shepherdess and a group of gypsies, but both reject him. He finally runs into a hermit and has a tender scene with the two becoming “fast friends”. But even this does not last forever as searchers looking for the monster, come upon the two and chase the creature away. He eventually comes upon Dr. Pretorius who promises him “friendship” and that he will create a mate for him. “The Monster: You, make man… like me? Dr. Pretorius approaches the newly married Frankensteins and tries to get Henry to help him create a mate for the monster. Henry, having once again realized the horror of his past creation, in no way will ever create another creature. That’s all fine and good, but Dr. Pretorius doesn’t agree. He wants a mate and is determined to force Henry to create one. He gets the creature to kidnap Elizabeth, her being the exact leverage to force Henry to create another monster. The Monster: I *love* dead… hate living. Henry seeing that he has no alternative, prepares to create a women from the dead. We see as Henry struggles with his morals, creating a better tension than in the first film. As I stated earlier, he doesn’t want to create another creature as he knows the horrors the other committed along with the fact that the two might mate and reproduce, populating the world with living dead. But Henry is excited at the same time. Once again he can use his theories and science to create. He will be able to say he “created” life, not once but twice! This is hard for him to turn away from. Of course nothing goes perfectly according to plan. Henry creates the woman, but can he control it? Elsa Lanchaster is amazing! I love the way she turns about, almost birdlike. She actually based her performance on swans; saying that, “they’re really very nasty creatures”. She was only 5’4″ but for the role they placed her on stilts so she was 7′ tall. The bandages were placed so tightly on her that she was unable to move and had to be carried about the studio, much like Olivia Newton-John in Grease. Her hair and outfit are amazing, and now such a classic figure in horror film history, just like her predecessor the Monster. Her amazing ‘do was held in place by a wired horsehair cage. They introduce her to her “mate”, but when has any woman liked it when people pick out their mates? The monster is furious at this rejection and destroys the lab killing all who are in it. The only people who escape are Elizabeth and Henry. Frankenstein realized what they had and allowed them to leave unharmed. It’s a great movie. I highly recommend it to anyone into the classic horror films. That’s todays fearsome post! More to come! Only 7 days left ’till Halloween! Who’s excited? Here’s poster I made for my cover page on facebook in honor of Halloween. Hope ya love it. 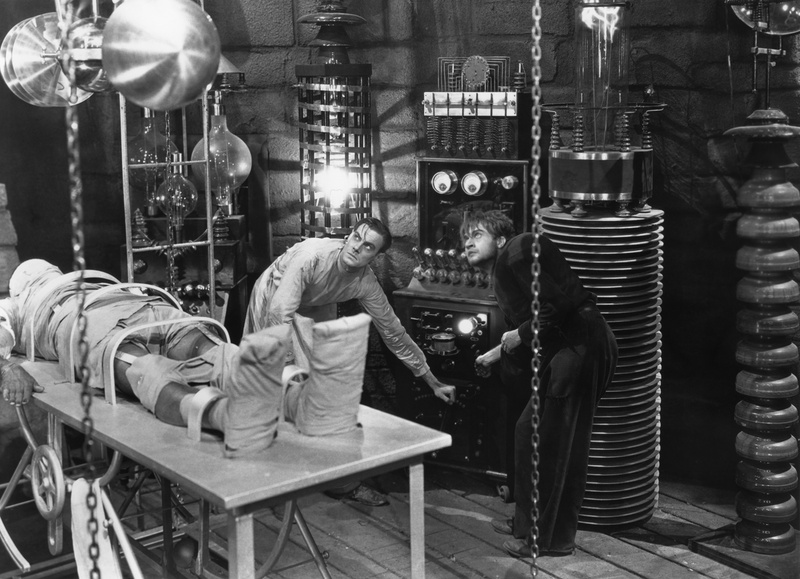 For more on Frankenstein, go to It’s Alive, It’s ALIVE! Edward Van Sloan: How do you do? Mr. Carl Laemmle feels it would be a little unkind to present this picture without just a word of friendly warning. We’re about to unfold the story of Frankenstein, a man of science who sought to create a man after his own image without reckoning upon God. It is one of the strangest tales ever told. It deals with the two great mysteries of creation: life and death. I think it will thrill you. It may shock you. It might even horrify you. So if any of you feel that you do not care to subject your nerves to such a strain, now is your chance to, uh… Well, we’ve warned you. 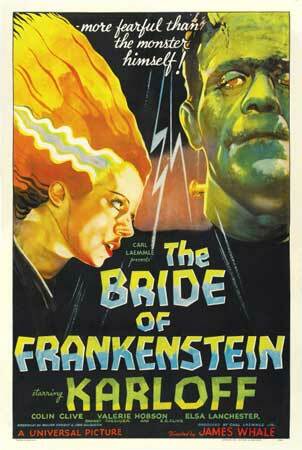 I have always loved this film, but I think The Bride of Frankenstein is much better. 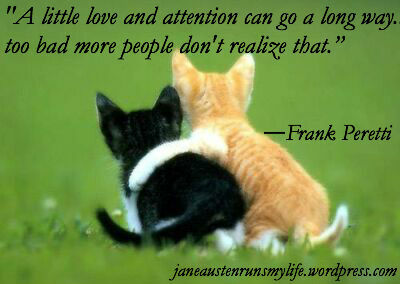 I will get more into why that is later. This movie is terrifying as we see a Frankenstein becomes consumed with creating this being. He won’t listen to anyone else and his behavior frightening his friends, family, and fiancé. Let me just clarify for everyone out there that the name Frankenstein alludes to Victor Frankenstein, the mad doctor who creates the Monster. For some reason they changed his name to Henry in this film. In the film his best friend’s name is Victor, while in the book it is Henry. Go figure. The Monster is never called by a name other than Monster, Creature, or something similar. It’s like The Creature from the Black Lagoon or The Thing from Another World, no proper names are given. The hunchback named Igor who helps mad scientists isn’t from the original Frankenstein, but comes from one of the sequels, Son of Frankenstein, where his name was Ygor; later translated to Igor. Anyways, Fritz is the one who makes the mistake of stealing the criminal brain. So Frankenstein starts getting ready to bring his monster to life. In the novel, Shelley never tells us how it is done; Frankenstein never wanted to share the details of the experiment for fear that someone would create their own living dead. With nothing to go off of, the writers and directors decided to use lightening, and therefore changeing film culture and film history as this is referenced and parodied in so many films and TV shows. “Henry Frankenstein: Look! It’s moving. It’s alive. It’s alive… It’s alive, it’s moving, it’s alive, it’s alive, it’s alive, it’s alive, IT’S ALIVE! Victor Moritz: Henry – In the name of God! Frankenstein is so intent on proving everyone wrong, so focused on completing everything that he never stops to think whether he should do this. This is an interesting question posed; how far is too far? 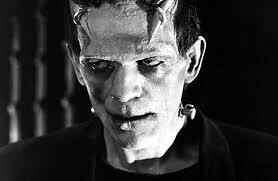 Played by the very amazing Boris Karloff; extraordinary actor. 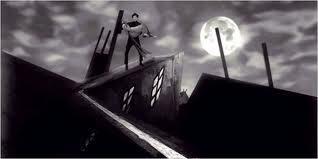 He almost didn’t play this part as they originally offered it to Bela Lugosi who turned it down. I’m glad it was Karloff, because as much as I love Lugosi, no one could have done this better. The green makeup that is such a part of the Frankenstein figure was used because it gave Karloff a deadlike pallor of skin. Now it has become such a strong part of culture, we see the green-skinned, bolted monster every October. After the Monster is created, we see this innocentlike creature. 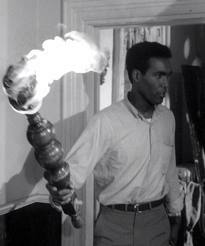 He is afraid of fire and tries to attack Fritz who brings a torch by him. All bystanders fear for their lives and chain the Creature up in the dungeon. Frankenstein and his friend Victor leave and discuss the best way to euthanize him. Unbeknownst to them Fritz is stupidly taunting the creature with a torch; causing the Monster to reach out and kill him. When Victor and Frankenstein return; they see Fritz’s dead body on the floor, and have to run away from the Monster as it tries to attack them too. 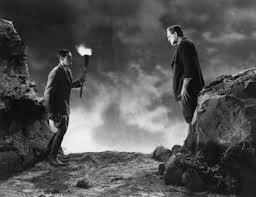 Frankenstein prepares a shot to kill him, and Victor gives it him. 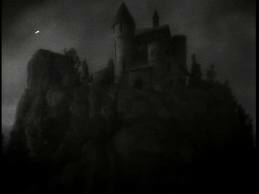 With all his problems solved, Frankenstein leaves to prepare for his wedding, and Victor begins to dissect the Creature. Unfortunately, the Monster didn’t die; but was only knocked out. He kills Victor and then escapes, running amuck in the countryside. He runs into a little girl, who is nice and shows him the flowers she is picking up. 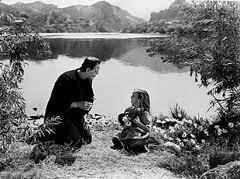 She shows him how flowers float in the river, which Frankenstein ultimately does to the little girl. Thinking that if he tosses the girl in the water she will float; he ends up ultimately drowning her. “Little Maria: See how mine floats. The farmer finds his daughter’s floating corpse and goes to pieces. He starts hunting down the monster; searching everywhere to find the fiend. Frankenstein, happily preapering for his wedding is brought news of Victor’s death. 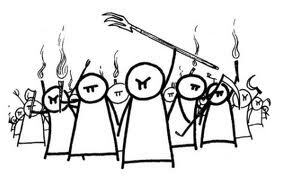 He goes out searching for the monster along with the peasants who have their torches and pitchforks at the ready. 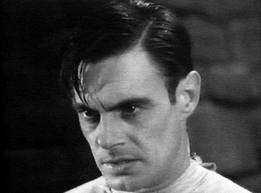 Eventually Frankenstein tracks the monster down and is prepared to destroy him. However the Monster knocks him out and carries him off to the windmill where he throws him off. Luckily, Frankenstein is caught by a vane and saved from death. There some peasants carry him home while others destroy the mill and kill the monster. Or do they? Frankenstein gets home, where we see that he is safe and sound and in the arms of his Elizabeth dear. After I watched the film a gazillion times, I read the novel and found it to be much more horrifying than the movie. In the book Frankenstein isn’t this bumbling creature, completely innocent and doesn’t understand things; but a criminal mastermind. Having learned to read and talk before he died; he is able to after some time remember how to do this and begins becoming more “human”. The one thing that he never regains is compassion, kindness, etc; all the caring emotions that make us who we are. 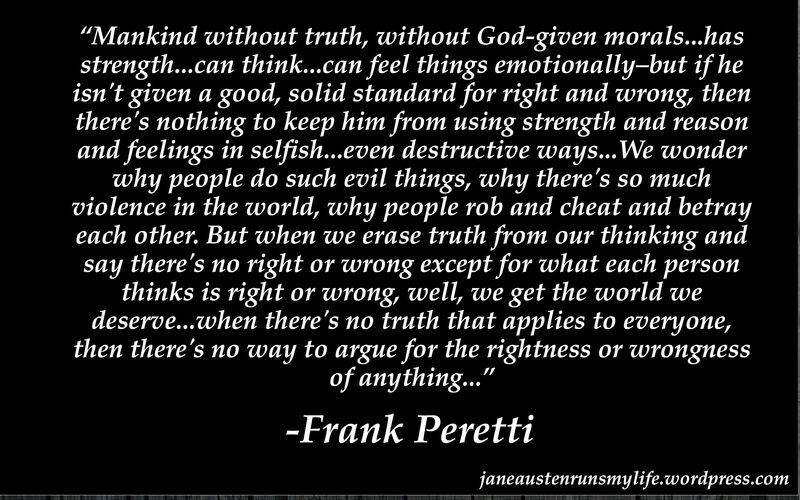 He has no empathy or sympathy, believing that he was shown nothing but hatred and cruelty so he must show this to all. 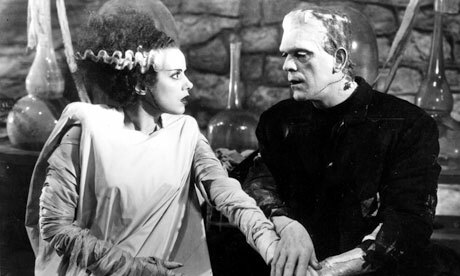 What they take from this and use in the sequel, The Bride of Frankenstein, is his want of a mate; his desire to have one like him to spend his life with. He threatens to destroy everyone that Frankenstein holds dear if he does give in to his demands. Frankenstein goes through a constant struggle with himself; knowing that he cannot risk creating another creature being made and mating along with the first. He realizes his mistakes at creating such a thing far too late. The monster doesn’t like hearing no and kills all Frankenstein loves. There is no sweet guy, accidentally killing someone like Lenny in Of Mice and Men, but this is a true psychopath fully aware of the crimes he is committing. Not only is the creature a serial killer, but he has become so intelligent that he is able to plant evidence so that people think someone else is the murderer. 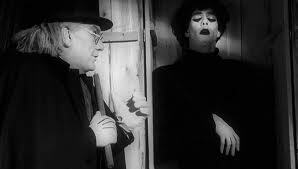 He kills Frankenstein’s brother William, and plants a locket on William’s nanny so that she is also killed. 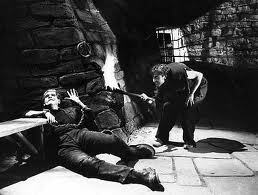 Then he kills Henry, Frankenstein’s friend, planting evidence so Frankenstein is arrested. He also kills Elizabeth, Frankenstein’s wife, making it seem once again that Frankenstein is the killer. With all those that he loves dead, Baron Frankenstein dies as well. After everything is gone from him; Frankenstein devotes his life to hunting down what he created and destroying it. It’s a great book, I suggest reading it and watching the film. There’s a classic terror for your Tuesday! More to come! I almost forgot to mention this. Unlike The Mummy, Dracula, or The Wolfman; Frankenstein has never had a major motion, globally shown, sent to all theaters, remake. However that is all about to change as Guillermo del Toro is planning one, and hoping that it will be coming out soon. To read more up on it go here. We shall have to wait and see what happens and how it turns out.